Please reserve the 2nd Wednesday at 10am for our General Meeting. Check our latest newsletter for the scheduled speaker and any meeting date/time changes. We will be off, the month of December , except for our annual Cookie Exchange on Wed., December 13th, 10am. Our 1st meeting in 2018 will be the 2nd Wednesday, January 10th. 10am See you then. Please check the latest version of our newsletter for the details of our next meeting. It's usually on the 2nd Wed. of the month, 10am. 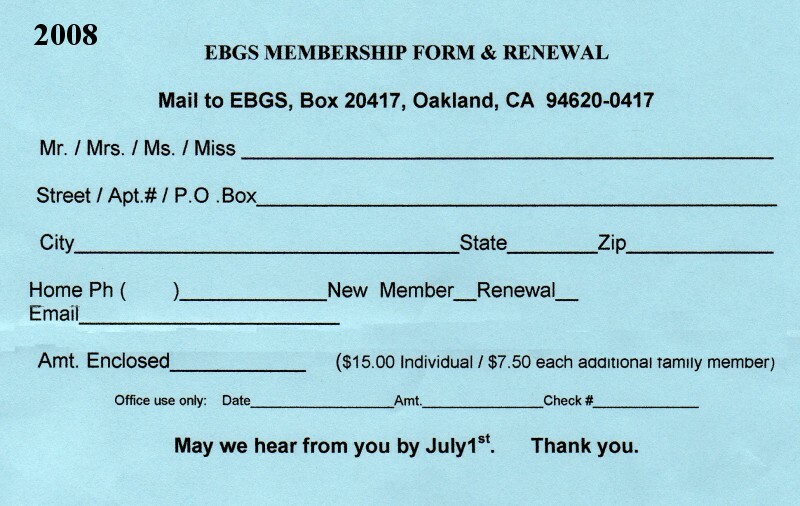 The East Bay Genealogical Society (EBGS) was established in 1978 for the purpose of promoting interest in genealogy, biography, and related history. See our officer page with a brief history of EBGS written for our 30th anniverary luncheon and a list of Presidents and Editors. Our blog contains the most current news of our group. Meetings are at 10:00am on the second Wednesday of each month. Usually meetings are held in the conference room of the FamilySearch Library of the Church of Jesus Christ, Latter Day Saints (the Mormon Temple) at 4766 Lincoln Avenue in Oakland, California. 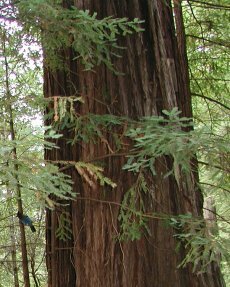 Ocasionally meetings are "field trips" to research sites. We are not affiliated with LDS but they are very generous to us and to all Family Search Library and Family History Center visitors, whether LDS members or not. Our EBGS library officially closed as of the first of June, 2012. We all appreciate the Mayflower Society's kindness in allowing us to retain one file cabinet in their library in which to store our important papers and files. Librarian, Lois Kline, along with Lynne Bajuk and Carolyn Storm spent many Mondays sorting books and files and discarding outdated material. It took a lot of work and a lot of time, but we managed to find good homes for our entire collection and were also able to offer some volumes to our members. Although our library has been closed - please be assured that the Mayflower Society Library is alive and doing well. They are open on Mondays a 9am-4pm, at 405 - 14th St. (at Franklin), Oakland, CA; Phone: 510-451-9599 and would welcome visitors and researchers. The President of EBGS is Sally Stevens. Please visit our EBGS Blog and leave a comment or send an email to caebaygs@gmail.com. Our mailing address is P. O. Box 1648, Alameda, CA 94501.